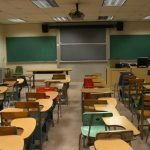 State Comptroller Thomas DiNapoli has officially confirmed what federal inflation statistics were already telegraphing: New York’s statutory cap on local school property tax levies will be just a hair above zero for 2016-17 school year budgets, which will be submitted for voter approval in May. The allowable levy limit is adjusted for locally variable exclusions, mainly reflecting growth in assessed values due to new construction or physical additions. Based on trends over the first four years of the tax cap, those exclusions will typically add at least a few tenths of a percentage point, and sometimes more, to the levy limit baseline for many districts. This is good news for taxpayers, obviously—but, predictably, school groups are concerned, citing the near-zero tax cap as justification for seeking a state school aid increase roughly twice as large as the $1 billion Cuomo has proposed in his fiscal 2017 Executive Budget. They also have called on the Legislature to loosen the tax cap. However, there are some offsetting factors school officials mention less frequently when they warn of a tighter cap’s impact. 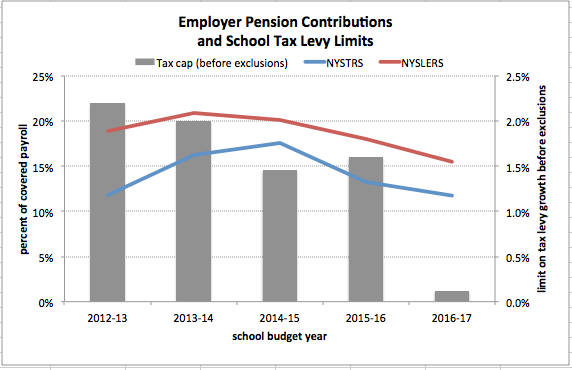 Most importantly, pension contributions to the New York State Teachers’ Retirement System (NYSTRS), a major driver of both spending and property tax increases in recent years, dropped sharply during 2015-16, and will decrease again for payments accrued in 2016-17 budgets. And so will pension contributions for non-professional staff, which peaked three years ago. In fact, as explained below, the two-year decrease in school district employer pension contributions in 2015-16 and 2016-17 will be equivalent to nearly 5 percent of current school property tax levies. Total school spending nonetheless is expected to rise, mainly because school salaries (already among the highest in the country) and health benefit costs keep going up. As shown below, pension costs are now reversing the earlier trend—but the tax cap law did not require school districts to reverse the tax cap exclusion. NYSTRS pension bills accrued in 2016-17 budgets have dropped to 13.26 percent of covered payroll, from 17.53 percent last year. Next year, NYSTRS employer contributions are expected to drop again, but at least an additional 1.26 to 1.75 percent of payroll. This is equivalent to a total two-year savings equivalent to at least 5.5 percent of payroll, or $795 million based on 2013-14 payrolls of about $14.4 billion. 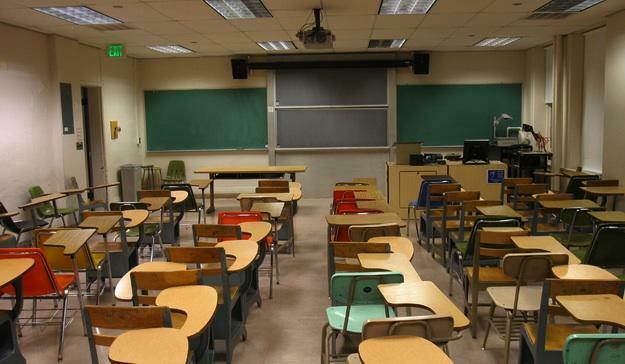 Non-professional school employees—e.g., bus drivers, custodians, kitchen workers and clerical staff—are members of the New York State and Local Employees Retirement System (NYSLERS), whose employer contributions rate have also been dropping—from a high of 20.9 percent of payroll in 2014, to 18.2 percent this year, to a projected 15.5 percent for bills due in the spring of 2017. That translates into a two-year savings equivalent of 2.7 percent of pay for those employees, or about $200 million. Based on the latest available data from the pension systems and the comptroller’s office, total pensionable salaries for school teachers and administrators equate to 42 percent of average operating expenditures for school districts throughout the state (excluding New York City). Salaries for other employees account for another 9 percent of expenditures. Statewide, excluding New York City, school districts will realize two-year pension savings totaling nearly $1 billion, based on projected contribution rates applied to estimated payroll levels from the SeeThroughNY.net salary database. That’s equivalent to about 4.8 percent of this year’s $21 billion in total school property tax levies. And pensions aren’t the only currently shrinking component of school district expenses. The crash in oil and gas prices—down $1 per gallon of diesel in the past year, on average, and $1.50 below the 2013 level—translates into lower transportation, heat and utility costs. School expenditures are expected to nonetheless exceed savings generated by reduced pensions and fuel costs due to increases in salaries (including contractual “step” and “lane” hikes typically averaging 3 percent a year for teachers who have less than 20-25 years seniority) and health insurance premiums (which in recent years have been rising by an annual average of 9 percent, according to the New York State Association of School Business Officers). NYSTRS and NYSLERS, like most other public pension funds across the country, actually are allowed by government accounting standards to set their contribution rates far too low. In fact, based on the latest stock market trends, both funds are losing money in their current fiscal years. Barring a return to double-digit market gains within the next few years, employer pension contribution rates could start rising again by the end of the decade. The pervasive under-funding of public pensions is an important long-term issue. For now, however, New Yorkers should also keep in mind that the 2 percent school district property tax cap was effectively nearly doubled three years ago to accommodate a portion of rising pension costs, thus adding permanently to local school tax levy bases. Pension costs are now dropping, a major savings for school districts. Transportation, heat and utility costs also have dropped sharply below peak levels. These trends will at least serve to significantly ameliorate the impact of a tighter property tax cap. Besides, the level of the tax cap is not ultimately designed to reflect school expenses but the real incomes of taxpayers, whose property values in many cases have barely recovered to pre-recession levels. 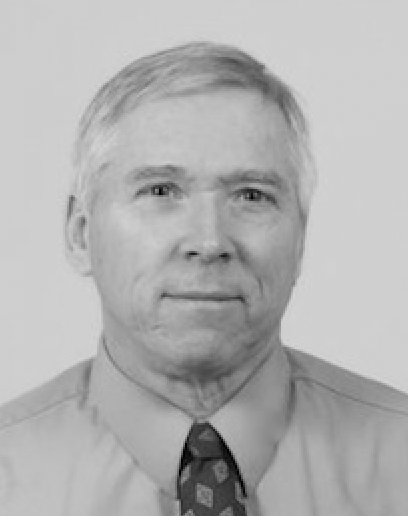 Rather than complaining about the cap and demanding higher state aid, school officials should redouble their push for mandate relief—including repeal of the Triborough amendment, which locks in automatic step pay hikes, and the adoption of more meaningful pension reforms that would make pension costs more predictable in the future. Organizations such as the New York State School Boards Association also have other solid mandate relief ideas on their agendas—which the Legislature and the governor should stop ignoring. A tax cap of zero, even with the safety valve of override, certainly poses a fresh challenge to school boards and administrators—but in a disinflationary environment, marked by decreasing pension and fuel costs, the situation is not quite as dire as school officials make it out to be. A greater test of Cuomo’s tax cap would come if and when inflation ever rises for a number of years well above the maximum cap of 2 percent—which many economists consider unlikely. The state Division of the Budget currently expects inflation over the next several years to average around 2.5 percent, which would equate to a basic school tax levy limit of 2 percent. School districts will need to manage their expenses—especially salaries—accordingly. Yes, tax cap near zero, but NY schools this yr and next saving also total of $1b on pensions. Cap exclusion let schools pass along chunk of 2013-14 teacher pension cost hike in proptax, now baked into the base. Instead of cap complaints, NY public school groups need to push harder for mandate relief.